Ready to rescue readers from the joy-sucking dully-funks is a 365-day devotional journal from popular inspirational humorist, Debora M. Coty--featuring just-right-sized, truth-filled readings (gift-wrapped in humor) alongside journaling space. 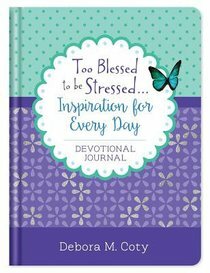 The Too Blessed to be Stressed...Inspiration for Every Day Devotional Journal touches on everyday life topics like relationships, love, boundaries, hope, brokenness, and praise, while helping you to arrive at healing, refreshment, and revitalization of spirit, body, and faith. About "Too Blessed to Be Stressed. . .Inspiration For Every Day Journal"
Debora M. Coty is a popular speaker, columnist, lifelong Bible student, internationally published freelance writer, and award-winning author of numerous books, including Too Blessed to Be Stressed, and More Beauty, Less Beast. She's also an orthopedic occupational therapist, writing instructor, and tennis addict. Mother of two grown children, Debora lives and loves in central Florida with her husband, Chuck, and desperately wicked pooch, Fenway.